Tejas Article : Samsung India Software Operations: On Verge of a Radical Shakeup? This article studies the organisation structure, culture and current challenges being faced by Samsung India Software Operations. The evolution of the organisation is traced as well as the significant influence of Samsung Korea on the culture of the organisation here. A comparison is drawn between Samsung India of today and Samsung Korea of early 90�s and how the organisation is facing environmental threats by re-engineering. Samsung India Software Operations (SISO) was established with the primary aim of creating better products and services for SEC, has evolved into a 2000+ strong organisation located in Bangalore. Within the last 10 years, SISO has grown from strength to strength having achieved software quality certification (CMM level 5) and ISO 9002. SISO is known to practice Six Sigma management methodology to maximize productivity. It has made significant contributions to Wireless, Networking, Convergence, Digital and Semiconductor technologies. SISO provides a beautiful example of several work cultures co-existing within the same organisation. On one hand is Wireless Technology Group (WTG), the largest division in terms of number of employees and revenues � with a mix of bureaucratic and mission culture. They are primarily involved in product commercialization. Hence, their focus is on achieving efficient processes and delivering timely products. On the other hand is Advanced Technology Group (ATG), the R&D centre, with Clan culture. The research outlook asks for flexibility and focus on the employees more than processes or results. 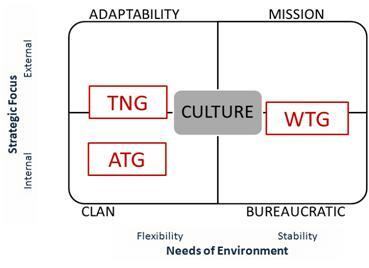 Telecom Networks Group (TNG) is a special case, with a mix of Adaptability & Clan cultures. The customer for most of SISO�s projects is some technology group in Samsung Korea. At times, these groups or teams in Korea might be competing with each other to come up with similar technologies. This strategy is used at Samsung Korea to promote internal competition and innovation. However, when the work is delegated to India, two Indian teams might be working on similar projects, but for different competing Korean teams. This leads to a situation where two teams might have conflicting goals but are unaware of the situation. This has led to a very stringent Security Policy at SISO. Secondly, there is interesting horizontal distribution of power between SISO�s groups. ATG, which predominantly follows a clan culture, is non-substitutable because the employees have high technical expertise. On the other hand the WTG, has a major say in the decision making process because it is the revenue generator at SISO. Also, because of its size (1600 employees), it has a significant amount of political power in the organisation and has a say in the resource allocation within the organisation. Moreover, various company policies are decided based on needs of WTG. For example: there is a strong emphasis on strict timings, late attendance, and strict adherence to formal procedures. These are necessary for routine tasks of WTG. However, application of similar policies in other divisions, where more flexibility is needed � creates a problem for the organisation. Curbing Imbalanced Growth: one division (WTG) yielding too much power. Improving Efficiency: In many projects, due to lack of adherence to formal procedures or lack of training � lot of extra time is spent. The newly appointed Managing Director, Mr. Bang Hun Chun further pointed out, �At SISO engineers are working very hard, pointed as out. But, it is more important to work smart than to work hard�. Fostering Innovation: With the dynamic environment prevalent today, it is important for SISO to brand itself as a true R&D lab for Samsung. It cannot afford to rest on its past laurels. This is all the more critical, considering the stiff competition posed by China R&D Lab. Interestingly, the challenges identified by us seem to have been addressed by two very recent changes in SISO: the appointment of a new Managing Director and drastic changes in organisation structure. Further, a major reorganisation was also accomplished at SISO. The new SISO structure is provided in Exhibit 4. Clearly, this structure was in line with the new vision of encouraging innovation and efficiency � by having laboratories instead of divisions. Interestingly, in the new structure the power of WTG due to its size was also taken away by dividing it into smaller groups. Is SISO of 2009, the Samsung Electronics of 1993? Based on our analysis, we found a number of similarities between SISO in 2009 and Samsung Electronics Corporation in 1993. The first of these was the loss of the low cost advantage. In Korea, with the removal of trade import restrictions, SEC lost its competitive edge that it had been enjoying for decades. Similarly, in India, with globalization flattening out the market into a level playing field, India is slowly losing the similar advantage. A second similarity is that the size of the organisation has grown exponentially. This has resulted in unprecedented levels of bureaucracy within the organisation. This can stifle innovation and result in a class of unmotivated managers. The objectives as enunciated by the new management were to evolve SISO into a global player, shift focus to advanced R&D, strengthen software development capabilities and develop SISO into a global training centre. 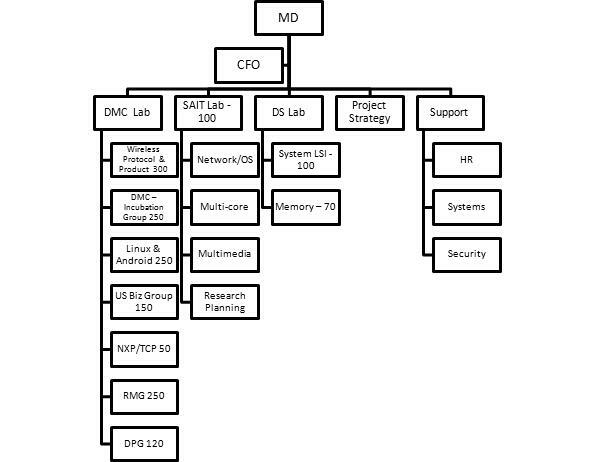 In order to achieve these goals, firstly a �Software Architect� programme was introduced to train managers extensively for a period of 5 years. The second measure was to implement strict adherence to the Software Engineering Principles to improve quality of SISO�s products. The third measure was the initiation of the process of transformation of SISO from an R&D Centre into an R&D Lab and eventually an R&D hub that would serve as a centre of global excellence. The final step to foster innovation was to re-brand SISO into a �highly recognizable organisation�. Given the limitations of the original organisation structure, re-engineering seems to be the key to foster greater growth and innovation at Samsung India Software Operations. This is more important in the light of recent developments of losing out on low-cost advantages and lower efficiency. How successful the re-organisation will be, remain yet to be seen. Image: Copyright 2007 Samsung Electronics, India Software Operations Ltd.